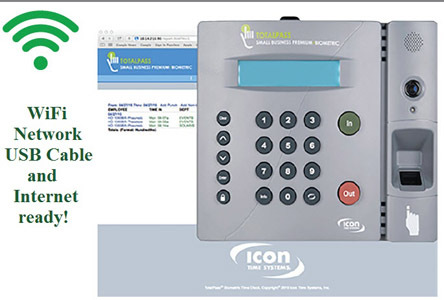 Florida Time Clock - Icon TotalPass Biometric with WiFi Photographs cheating punches! Guaranteed Lowest Price on the basic system and the badges. 28+ years experience, advice, and guidance, included. You communicate to it by opening up a "favorite" from your web browser - locally, and off-site. There are no driver updates needed. No software needed for your computer, (unless you want to use the included USB connection). All Icon computer clock terminals are remotely upgradeable. They use an innovative “flash” technology which rewrites the internal firmware. As the years go on, you normally have to throw away equipment - computers, time clocks, hard drives, hardware, etc. Icon can electronically 'rewire' the terminal for new technology. As improved operating systems get released, the machine can be updated, and does not need to be replaced. This device works with all Operating Systems. Apple, Windows, anything that has a web browser. Other manufacturer's require you to buy new equipment every few years. Not Icon. The TotalPass is Future-Proofed.